"I'm reminded of the definition of a Watermark that we came across so many years ago: 'An impression only visible when held up to the light.' The Light of this world is moving and pursuing people who will align with who He is, no matter what it takes, so that He becomes visible through us to the world. As we move where He's moving, with His purpose and His heart, He takes shape in us, we come alive, and His glory is shown on the earth around us." Delta Dawn: The young Colorado River delta is a lush breeding ground for finfish, shrimp, crab — and controversy. Washing the Water: Wetlands at Richland Creek Wildlife Management Area act as a huge water filter, removing pollutants the natural way. 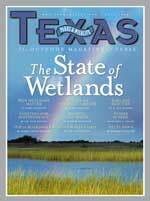 But alas the piece most important to my heart is my Part 2 on the San Jacinto River, Sustainable Solutions that just came out today. My Louisiana black bear piece should be out any day also. Ciao for now! I have been working hard, writing away. I finished one article on Kemp's ridley sea turtles, FINALLY finished my sample chapter of my book, and am finishing another on sand mining. I have a zillion errands to run around town, getting everything I might possibly need in Australia (it's not like it's a third world country! I kill myself. lol). I needed a new tripod since I left mine in Peru, and I decided to buy my kids an inexpensive digital camera. Once you've gone digital baby, you'll never go back! The kids each had a cheap camera, but the film and developing costs are just not worth it. For less than $100 you can have a nice digital plus a memory card. And they can take as many pics as they want. It kind of plays into my article on Australia anyway, which is can I make a nature lover out of my tween (Savannah) who is more into video games and books than nature. I think getting to photograph things will inspire her, the way it did for me when I first went to Australia. I got my first 35mm cam upon my return. OK all for now, back to the grindstone... 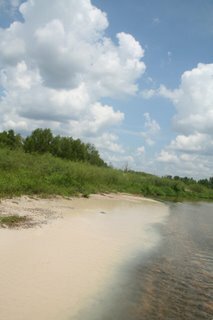 I will upload some ugly sand mining pics from being out on the river the other day soon! Eegads this company is just spewing muddy water into the river. I laughed at the conversation of the biologists I was with. There was a guy going out on a boat with his kids on the river, and they were like, Can you imagine what it's like to be the one who pollutes the river and having to go out on the river? And the other was like, That IS the guy! He goes out on the river while his lackeys run his operation. And the other says, How could I be so naive? Well anyway the conversation went something like that! Update: this photo takes two glances to appreciate. The left part is NOT the sandy bank, but silty water being actively dumped by a sand mine. To the right the water runs so lear you can see fish. The sediment is so heavy and persistent that it affects the river for twenty+ miles downstream. Of course this causes all kinds of problems (read my 2 articles on sand mining at CleanHouston.org to learn all about the problems and solutions)! On the eve of my last 35th unbirthday, I reflected on my run that it has indeed been a good year to me. I can finally say that I am truly happy and I feel truly blessed. I don't have a man or relationship that I'm pining after ("it takes a damn good man to be better than no man at all" is my favorite saying!) but I am happy in myself. I enjoy my freelance career. I love my freedom. My kids are growing up, happy, healthy, loving people. Life isn't perfect, and certainly nor am I, but I have great friends, great kids, a wonderful career, great health and a great and loving God! i've got a sickness what can i say? it's called wanderlust. and so with a little click of my mouse, i bought 3 tickets to australia - myself and my two kids! so i better get cracking at hauling in some new projects. australia holds a special place in my heart. it changed my life, it changed my career path. i did a study abroad program there in 1990-1991 studying rainforest ecology in far north queensland. before that, i was pre-med. i fell in love with research and studying wildlife. i loved the country so much i decided to stay on another 2 mo, living with a family and doing volunteer wildlife work. i remember i called my mom one time and she said, "when are you getting back to the real world?" as if australia and that adventurous lifestyle wasn't the "real world." it was my world, it was where i was living and working and having the experience of a lifetime. whose to say it's somehow inferior and not the real world? so what if i took one measly semester off of college? i finished! i have two dear friends who i still keep in touch with, and i recently found out one of my best friends from high school moved over there and so i have 3 people to visit and stay with! and they all have kids, so my kids should have a truly lovely time. we will not get back to far north queensland, but will spend time in brisbane, fraser island, airlie beach, and tasmania! i added in tasmania because not many people go there, it's supposed to be drop-dead gorgeous, and i figured i can sell more pieces on a place more off the beaten path. i have wanted to get back there since i left. i met matt in summer 1991 just after i returned and it was all i could talk of. i always wanted to go back but never did. my fear of flying developed not long after and it was probably one of the reasons i justified not getting back there. so now i've come full circle, my fear of flying has dissipated and i hope that i don't just get utterly sick of flying with all the time i'll be spending in airplanes! my goal is to take my kids on a life-changing eye-opening journey to another culture, and another land full of strange and exotic beasties. they have never been out of the country (except on our drive to alaska and they were so young) so it should be all new and all exciting! savannah was always telling me how *I* always got to go to all these cool places and she never got to go. so now there you have it. she can't say that anymore.